You may have noticed over the last few months, we’ve gone quite quiet on changes, updates and telling you about what we’ve been doing. 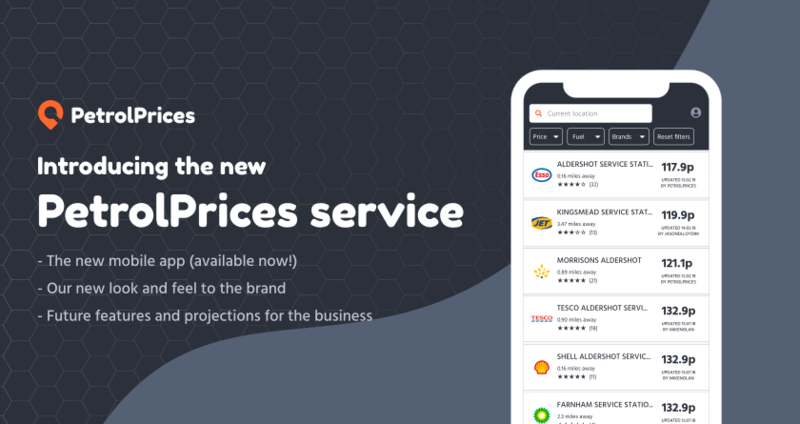 Today we’re thrilled to announce that we’ve been working harder than ever before to bring you the new and revamped PetrolPrices service. You can probably tell some of the changes already, by the design of this page, the colours and the new logo. If you’ve already got the update for the app on your phone, or if you’ve logged in to the website today, you’ll notice our massively improved fuel finder. On our mobile app, which you can download here you’ll be able to update prices of stations! Our support team tells us that above everything else, this is something that you, our members want, and so after a long time planning, building and checking, we’re really happy to announce that yes, you can now update prices on our mobile app! Everyone can now also update facilities information about stations, and help other members find facilities at stations near you. Does a station have a car wash, ATM or does it offer FuelService? We’ll be expanding this soon with opening times and detailed station pages, but we think facilities is a pretty good start for all of this. Something else we’ve introduced is reviews. Does a forecourt constantly have dirty pumps, is one pump a bit dodgy or is the coffee at this station much better than all the others locally? You can now comment on all these things and more in the new reviews section. On the mobile app, simply head to the station your interested in and then answer a few quick star rating questions before inputting a full written review. You’ll also be able to see the overall rating for a forecourt, along with other members reviews. If you’re in a new area and want to fill up at a station with a great score, then look no further as in the main search you can see the average rating of each forecourt. On top of all of this, you can now gain points for all of the above. For example, updating a price can earn you five points, confirming a price gets you five points and if you confirm/update all the prices for one station you get ten points. For reviews, you’ll get up to 10 points for a written review and up to five points for a quick-fire review. There’s a UK leaderboard, so if you constantly review stations, confirm prices and complete tasks within the app you’ll climb our leaderboard and soon you could be at the top of the leaderboard. You’ll also get extra points for being a consistent high scorer, searching regularly and logging in repeatedly. There’s plenty of ways to earn points, but we’re not going to give it all away just yet! These points are subject to change as we develop and improve the app, so please don’t take these as concrete.